J Sainsbury PLC, along with the other major supermarkets, has been through the wars in recent years. Most people know the story by now, if only because of the more severe and highly publicised problems at Tesco. Here’s my extremely short version of the backstory for J Sainsbury. The big four UK supermarkets (Tesco, WM Morrison, J Sainsbury and, to a lesser extent, ASDA) had it fairly easy. As long as they did a half decent job, millions of shoppers would continue to shop with them. But then along came the Financial Crisis and the Great Recession, and shoppers had far fewer pennies to spare and more time on their hands to shop around. The result was a change of shopping habits to more frequent and smaller shopping trips, at local stores that focus on price more than anything else. That played right into the hands of discounters Aldi and Lidl, who fitted this new shopping behaviour like a glove. The initial response from the big supermarkets was to ignore the discounters, but that was a massive mistake and the big four have been losing market share and struggling to adapt quickly enough ever since. Here are J Sainsbury’s results up to the 2015 financial year. As the chart shows, things had been going very well. The company has a long and unbroken record of dividend payments and, in recent years, revenues, profits and dividends had all been going strongly. 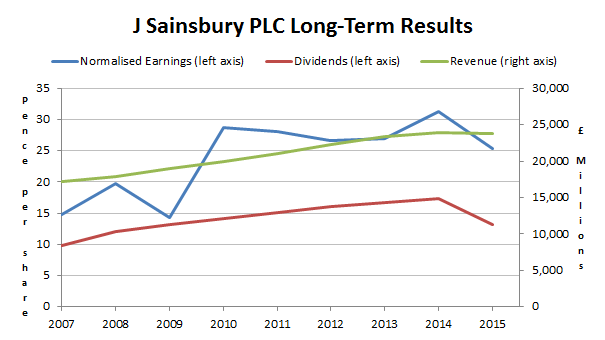 So J Sainsbury has grown fairly quickly and smoothly over the last decade, including the profit and dividend decline in the 2015 results. However, its profitability as measured by Net ROCE (Return on Capital Employed) is weak. Because I use post-interest and tax profits as the “return” part of ROCE, this low profitability figure could be because Sainsbury’s core business isn’t very profitable, or because the company has lots of debt (and hence large interest payments) or other non-operational expenses, or both. J Sainsbury fails that test, so that’s the first reason I would be buying the company’s shares. But there are other reasons too. One of the reasons for Sainsbury’s weak profitability is its large debt obligations. It has £2.8bn of total interest-bearing debts as at the 2015 annual results. That sounds like a lot and it is, especially as the company has “only” earned an average of £0.5bn in post-tax profits over the last 5 years. Another large financial obligation is its defined benefit pension scheme. Because the company must ensure that its pension fund assets exceed the fund’s liabilities, it must pour cash into its pension fund if there is a deficit. And that’s exactly what it’s doing today. The pension fund obligations stand at £7.7bn, while the pension deficit is £0.7bn. That deficit must be closed, and the company has agreed to pay £49m into the scheme each year until 2020, which currently amounts to almost 10% of the company’s post-tax profit. So along with “too low” profitability, J Sainsbury also has “too high” financial obligations for me. As a result, I won’t be buying the company’s shares anytime soon, no matter what the price. Even though I wouldn’t consider buying the company’s shares at the moment, I’m crunching through the accounts anyway so I might as well take a look at what share price might be considered “fair value” given its financial history. The caveat here is that this fair value would only apply if the company wasn’t breaking any of my rules of thumb, but it’s still an interesting value to calculate. As J Sainsbury has a slightly above average record of growth, its shares, according to my valuation system, deserve a slightly above average rating. So in terms of valuation, J Sainsbury is significantly more attractively valued than the FTSE 100. Its share price is cheaper than average, relative to past earnings and dividends, and the dividend income yield is above average. And remember, the company also has a better track record of growth than average, so if anything it should be on higher valuation multiples than the index (ignoring its various problems, of course). To calculate fair value for the company’s shares, I can adjust its share price until it has a middling rank on my stock screen. At its current 261p, J Sainsbury has a rank of 47 out of 230 companies on the screen, so it is one of the most attractively valued (again, ignoring its problems). For the shares to be “fairly valued”, they would have to increase to 450p, which is some 72% above their current share price. At that level the shares would have a historic dividend yield of 2.9%, which I think would be reasonable as long as the company’s successful past could be replicated in future. However, the company’s profitability is too low for me, and its financial obligations are too large, so I won’t be investing at the moment. Disclosure: I own shares in Tesco and WM Morrison and they are both holdings in the UKVI Portfolio. Note: Last time I looked at J Sainsbury’s shares I was much more upbeat. However, since then (May 2014) I have become more cautious about both profitability and financial obligations (partly as a result of the problems with Tesco and Morrisons), so under my now much stricter system, the company has gone from a buy to uninvestible. I only hold Tesco in the supermarket sector. It was one of my first purchases a long time ago. In reality, if I was to have the decision all over again with the methods I analyse companies now with I would not have bought into them. I think the big supermarkets (certainly Sainsbury’s and Tesco) have a good chance of stemming the tide of customer and earnings losses. As you say, the going was very good for so long it is perhaps good–for the long-term–that they are now being a little tested. This is especially the case for Tesco which clearly became too bloated and unfocused. I am happy to hold Tesco for now. Indeed, I have noticed that they have improved in customers eyes (from a purely personal experience) which is a good sign. What is more, my weekly shop is now with Tesco rather than Sainsbury’s as I have noticed improvements myself. But I will not be looking to add any other supermarket exposure, I think! Hi DD, my supermarket holdings are similar in that I bought them a few years ago with a less refined approach. I don’t think I would buy any of them now though (although that doesn’t necessarily mean I’m looking to sell them either). Regarding Tesco, it’s my local supermarket so that’s where we go (“we” as in my wife… I rarely visit the dreaded supermarket). What I’ve noticed is lots of banners in bright yellow with large money off offers on every aisle. It’s not as aesthetically pleasing as the old CEO would have liked, but if cheaper food over aesthetics what customers want, that’s what they’ll get. I have no faith in a turn around for the majors. Aldi and Lidl are creaming them by 30-40% off, and the quality of food is just as good, if not better for the fruit and veg. This is like the arrival of the discount airlines, the old dinosaurs are not setup to fight the new war of cost attrition, the supermarket landscape of the UK in ten years will be totally different imho. Hi Underscored, you could well be right. One major problem in this industry is the capital intensity. These companies require massive ongoing capex, so they’re very difficult to radically change because of all the sunk costs into existing, possibly outdated, infrastructure. Aldi and Lidl’s setup is tailor made for this environment, although personally I think that was more luck than judgement. If it hadn’t been for the financial crisis then their growth would have been far more incremental than the giant leaps we’ve seen lately. It will be interesting to see if you’re right about the 10-year picture. Tesco are definitely turning it around, but it’ll take years. Once they sell off a few bits of the business and refocus, the share price should rise. Don’t think we’ll see 300p any time soon though. Like you, even at these levels I wouldn’t touch Sainsbury’s. Thanks Simon. I’m not sure how well the Tesco tanker is turning, but it is definitely a multi-year event. And I’m not holding my breath for 300p either. Whether I continue to hold or not depends on how it all pans out and what the share price does. Its an ugly baby contest. I use 5 year period for ROCI as its more sensitive to changes in profitability and takes in the business cycle. On that basis Sainsburys looks better than Tesco or Morrisons. Morrisons has been growing the dividend at a faster rate though. I like the analogy! Morrisons dividend is expected to fall next year though. They somewhat bizarrely stuck to a previous commitment to grow the dividend at a certain rate, even though their situation had dramatically changed and the old commitment was probably no longer sensible. My gut feel is that Tesco will come out of this better than the others, but that’s just pure speculation. Hi John, 15% would be a better measurement criteria and it’d probably help avoid a future Tesco, Serco or one of the car crash utilities on the horizon when interest rates rise. It seems difficult to justify retaining a holding in Tesco which still has a P/E (24.6), more than twice that of Sainsbury, an even bigger ballooning debt scenario than Sainsbury and a reduction in operating margins that will ensure the former are in perpetuity unless someone has some fairy dust that will be sprinkled over the exhausted food retail outlets across every town and city in the UK. Perhaps the Grinch will descend on Whoville (Cheshunt) and magic it back to health! Hi LR, I think 15% would be too restrictive. 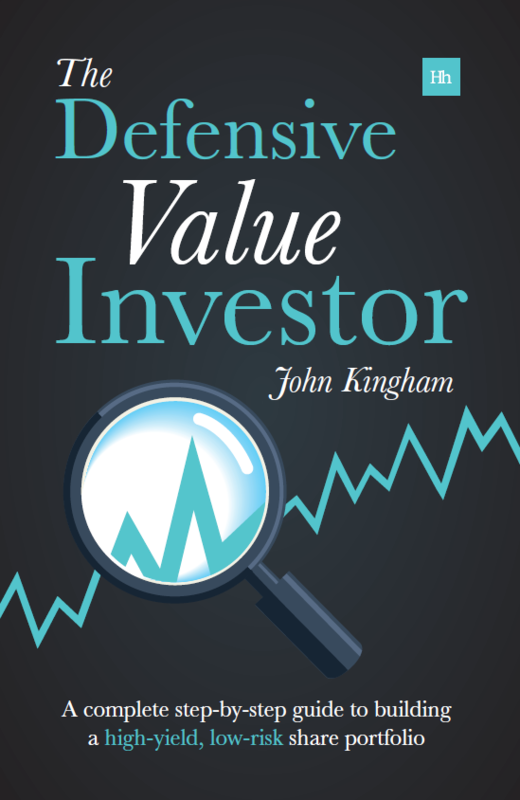 I’m not a defensive investor like Terry Smith, I’m a defensive value investor, so I like to be able to buy value stocks, and that sometimes means less “excellent” businesses trading on very low multiples. From the data I have, 7% seems a reasonable floor for “good” companies. It’s also the long-run return for the stock market (assuming 2% inflation) and my thinking is that I’d rather not invest in a company where the retained earnings are not even giving me the expected return of an index tracker. As for Tesco, I still hold, but not with any particular conviction. Whether or not I sell just depends on how its share price and fundamentals compare to the other 230 stocks on my stock screen. Currently it’s close to being my “worst” stock (i.e. lowest ranking on the screen) but not quite. So don’t be surprised if I sell it it this year. Hi John, If it’s any consolation I took a loss on Tesco myself, but fortunately having exited Sainsbury at a profit, my fleeting experience with supermarkets was not too painful if not exactly exciting. Not sure I can muster up further interest on the basis that 10-15 years ago you were lucky to have 2 supermarkets in each town. Now, they are positively on every other corner. It’s a disastrous market, irrespective of who comes top of the table. As they say, “it’s could get a lot worse before it gets any better”, if that’s even possible for Tesco. Personally I’m not looking for a turnaround in that company any time soon. These things tend to take at least a year or two before the first signs of anything good turn up. And it could be a lot longer than that. John I think if anything Tesco and the sector needs a sentiment change more than anything. Irrespective of the finances the sector is out of favour big time. I’m sure that will change and you could recover some of the loss, in which case a reassessment can be made. Incidentally, I think we share similar views on some of the utilities. I wonder if you see National Grid as an exception amongst the pack, given it seems to hold less of a negative political position and is not exposed to the vagaries of generation like the SSE’s and Centrica’s of this world. The debt’s high though and it seems difficult to evaluate the impact of rising interest rates on that debt in NG’s case. It’s something like £22BN in Borrowings (albeit backed by huge assets) and a fairly constant (well over the last 5 years anyhow) pre-tax income of £3.7Bn (Post tax considerably less) — giving a ratio of some 6X and more post tax. I held Tesco but when I got a smell of accountancy problems I sold them before the announcements were made which dragged on for an age. Any Major PLC that operates for any period without a Finance Director needs to be scrutinised. I still lost 20% on my original investment but could have lost 40% . I would not hold any of the Big 4 going forward but prefer to invest in the new Online Retailers in the Drapery and related products. I hold Marks & Spencer which has adapted it’s business model very well. Watch out for the German company – Zalando.se . Hi Ray, that may well have been a smart move with Tesco, although that sort of quick-footed exit isn’t something I ever try to do myself. I agree with you on the Big Four, or at least the Big Three as you can only invest in ASDA via WallMart, and I don’t do international stocks. 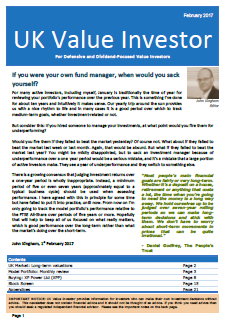 None of them look particularly appetising, although they have certainly taught me a lot about how bad things can get at even the bluest of blue-chip stocks, and therefore to be more cautious in my approach to analysing them. And thanks for the heads-up on Zalando. I don’t do international stocks but there’s bound to be someone reading this who might be interested. Could Tesco’s turnaround involve all that land they own which they were going to build stores on but may now use to build residential properties on? Or perhaps that would be a diversification step too far? I’m holding onto my Tesco shares in any case. Hi Weenie, I’m afraid I really don’t know. Tesco’s attempt at a turnaround could involve all sorts of things, but I prefer not to speculate on how a company will do what it needs to do. That’s what management are there for and I have no real expertise in how to run a multi-billion pound supermarket. As an investor I hope to select “good” companies with good management/employees and then let them get on with it. I’m holding too, although mostly because I’m a “low frequency trader” rather than out of any great conviction in Tesco’s future.